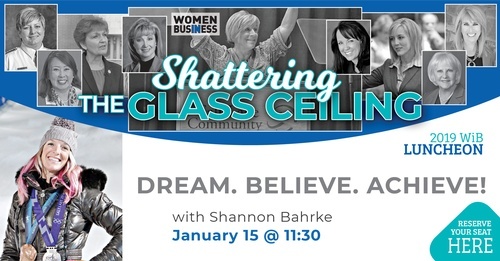 Part of our Women in Business Luncheon Series - Shattering the Glass Ceiling... DREAM. BELIEVE. ACHIEVE! You will want to attend! Join us and enjoy networking with other professional women. Join us with registration/networking from 11:30 - 12:00; lunch and program at 12:00. Parking: Plan to park in the Utah Olympic Oval Parking lot as the building entrance is directly across the sidewalk from the Utah Olympic Oval. $20 with advance registration prior to January 11th or $30 for non-members or at the door. 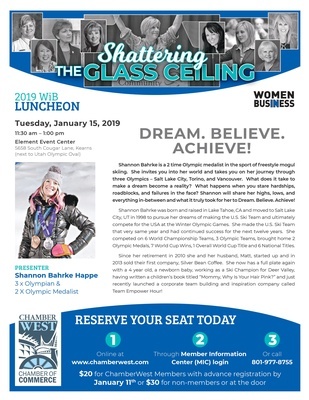 Pay online at www.chamberwest.com or by calling 801-977-8755.